Welcome to our 2018 Newsletter. I read an article in Compendium November/December 2017 vol. 38 number 10 about potential oral effects of marijuana use. The main concern is from smoking marijuana, and risks seem to be similar to smoking tobacco. Like tobacco, there are lots of nasty stuff that are released when marijuana is burned. These components cause inflammation, and can contribute to periodontal (gum) disease which is one of the most prevalent chronic diseases in our country, and a significant factor causing tooth loss in adults. Other causes like genetics, age, diabetes, tobacco use and lack of good oral care also contribute to the severity of gum disease. Marijuana smokers may be up to 3 times more likely to develop advanced gum disease. Other side effects of cannabis use may include dry mouth which can lead to an increase in tooth decay. It may also cause an increased in soft tissue irritation inside the mouth. Since patients are using marijuana for medical reasons, we dentist cannot simply say -"quit", like we may for tobacco use. Perhaps the solution maybe to switch to an edible form. Time and following patients response will likely give us some recommendation and guidelines. 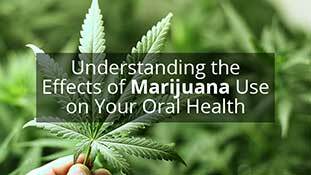 So if you are using marijuana for medical or recreational purposes, it is probably a good idea to let your dentist know, it may help explain why you are having problems with gum disease. The American Academy of pediatric dentistry has issued guidelines for the use of silver diamine fluoride to treat cavities in pediatric and special needs patients. Silver Diamine Fluoride (SDF) contains about 24-28% silver by weight and 5-6% fluoride. Apparently this agent will likely stop the decay process in a tooth. It is indicated for child patients, who have behavioral management problems and the cost or risks involved in sedating or general anesthesia make conventional cavity treatment not feasable. The treatment is safe. Exposure to one drop of SDF has less fluoride than what is present in 3.25 ml of topical fluoride varnish. The main disadvantage of SDF is it will stain the tooth structure touched to black. Soft tissues like lips, gums, cheeks and tongue will also satin but this will go away about 14 days after treatment. Use of SDF on front teeth may pose an esthetic issue, but it is probably better to have dark teeth than a tooth abscess. SDF is economical, it does not interfere with the future placement of a conventional filling. I have to do a bit more research, but SDF sounds like a real game changer to help at least get decay under control. I recently had my second colonoscopy done. 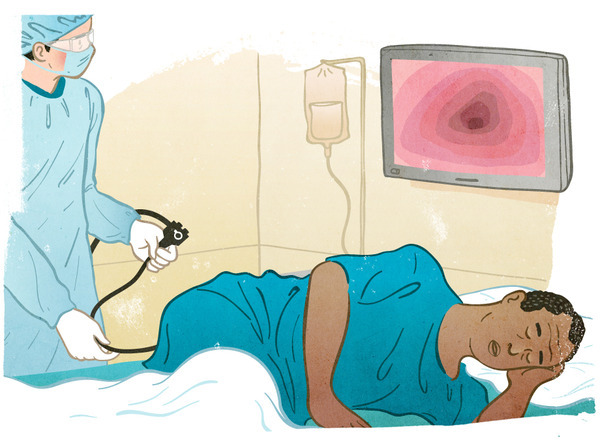 There is a history of colon cancer in my family, so the procedure has been strongly recommended. My results were pretty good. Two small benign polyps were removed and my doctor said, "See your colon in 3-5 years". Oh Joy!! I encourage everyone to consult with your doctor about getting this procedure done. The preparation is not much fun, but the peace of mind is priceless. ATTENTION : We will be offering some Saturday appointments call the office at (708)423-4100 for more details!